Va., as manager, international marketing. Mr. Pearson was for- merly vice president and director of marketing with Iotron Corpo- ration of Bedford, Mass., where he had overall responsibility for marketing and sales of Iotron's line of radars and other marine electronic products. At Navidyne, Mr. Pearson as- sumes responsibility for overseas marketing of Navidyne's marine navigation and communications equipment. Navidyne Corpora- tion is a leading manufacturer of advanced marine electronics for the worldwide shipping and off- shore oil exploration industries. Co. reported recently that oper- ating income increased 35 per- cent to $111 million from $82 million in 1981, the fourth year of higher operating income. Nimitz-class nuclear-powered air- craft carriers, the shipyard had a year-end backlog of $8.5 billion. Navy. "We are pleased with our 1982 financial performance," said Ed- ward Campbell, company presi- dent and chief executive officer. "Much of the credit goes to our employees, salaried and hourly paid, who have responded to the challenge of working smarter and increasing productivity." March 1, 1983 worked on the Nimitz-class car- rier Theodore Roosevelt and nine nuclear-powered submarines. In the fourth quarter of 1982, income from continuing opera- tions was $278 million, up 9 per- cent from 1981. D.C., is the contracting activity (N00039-83-C-0210). SFC BW separators feature a permanent filter bed (no dirty cartridges to change, no messy disposal). Automatic operation without attendance is available. 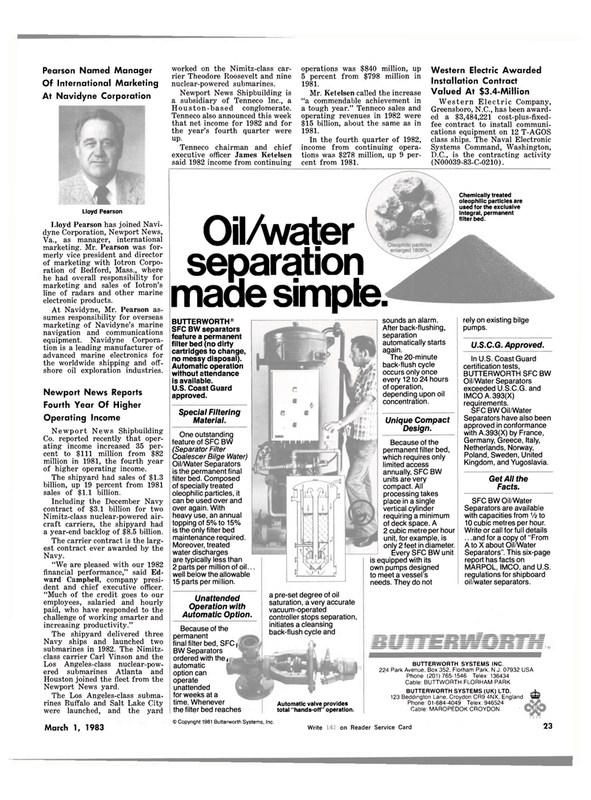 Oil/Water Separators is the permanent final filter bed. Composed of specially treated oleophilic particles, it can be used over and over again. With heavy use, an annual topping of 5% to 15% is the only filter bed maintenance required. Moreover, treated water discharges are typically less than 2 parts per million of oil... well below the allowable 15 parts per million. Automatic valve provides total "hands-off" operation. sounds an alarm. After back-flushing, separation automatically starts again. The 20-minute back-flush cycle occurs only once every 12 to 24 hours of operation, depending upon oil concentration. Because of the permanent filter bed, which requires only limited access annually, SFC BW units are very compact. All processing takes place in a single vertical cylinder requiring a minimum of deck space. A 2 cubic metre per hour unit, for example, is only 2 feet in diameter. Every SFC BW unit is equipped with its own pumps designed to meet a vessel's needs. They do not rely on existing bilge pumps. Separators are available with capacities from Vz to 10 cubic metres per hour. MARPOL, IMCO, and U.S. regulations for shipboard oil/water separators. Cable: MAROPEDOK CROYDON © Copyright 1981 Butterworth Systems, Inc. Chemically treated oleophilic particles are used for the exclusive integral, permanent filter bed.